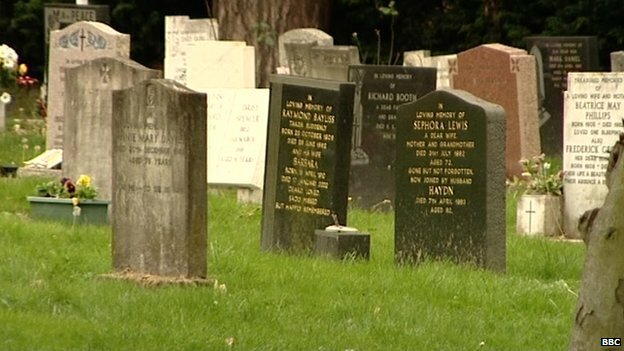 An increase in the cost of funerals has left many families under "huge strain" to pay for them, according to a report. The Church of Scotland's report showed that in some areas charges have increased by almost 300% in five years. The church said its officials were working with funeral directors to provide ways of supporting bereaved families. A spokeswoman for the National Association of Funeral Directors said a significant percentage of funeral costs were outside their control. She said items such as the cremation fee, burial fee and doctors' fees for signing cremation papers increased every year. The spokeswoman said the NAFD was concerned that, in an attempt to fill gaps in their budget, councils were levying excessive fees on people when they were at their most vulnerable. The South Lanarkshire council area saw the steepest increase in burial and cremation costs. It had the largest increase in cost for the purchase of a burial lair in the past five years. Convener of the Church and Society Council Rev Sally Foster-Fulton said: "These significant rises in cost have the potential to put a huge strain on people at a time when they are already dealing with the loss of a loved one. "At a time when welfare reforms are causing many more families to struggle financially, we are also concerned that those who can least afford it will suffer most and pressure to 'do right by their loved one' could put them in debt." The Church's Church and Society Council and Ministries Council compiled the figures following last year's General Assembly when ministers raised concern over the spiralling cost of funerals. The Church has met representatives of the National Association of Funeral Directors to look at the issues raised and to explore ways to support bereaved families. Depute Presbytery Clerk of the Presbytery of Lanark, Rev Bryan Kerr, said: "As a parish minister, I continue to be concerned about the high charges levied at families in times of bereavement. "In our area, costs have trebled in the last five years - three times the Scottish average. I remain to be convinced that local authorities are not making a profit out of people dying." The National Association of Funeral Directors spokeswoman said: "A 2013 study showed that since 2007 burial fees had risen by 69% and cremation fees by 51%. "In contrast, funeral directors have worked hard to keep their own costs down with only a 3.5% rise in the cost of their services in the past year, due in the main to the labour and property-intensive nature of their businesses." Oil giants Shell and Taqa announce plans to cut hundreds of North Sea jobs, citing "challenging" times for the industry.